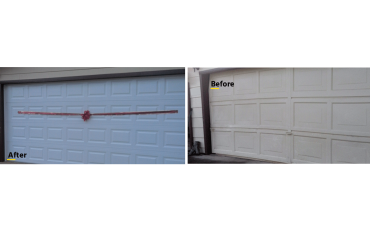 GET YOUR GARAGE DOOR REPAIRED TODAY! 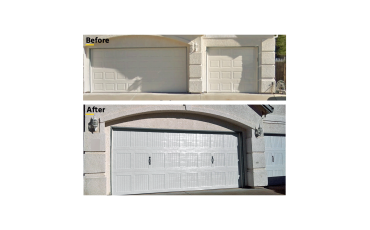 On this project we replaced an old one-piece garage door, and installed a brand new sectional garage door and motor. Address of the project: Arizona St, Redding, CA 96002, located in Shasta County. The garage door we installed: 16×7 garage door, short panel, sectional, white color, high quality 24 ga steel, insulated garage door, U224 series. Brand new hardware and garage door springs where installed. We took care of the removal and disposal of the old garage door. This project required the installation of top and side garage door trim to seal small cracks that usually can be seen between the garage door and the garage frame. The garage door moulding not only makes your new door look much nicer, but also helps keeping the garage insulated and prevents bugs and debris from getting into the garage. The garage door opener we installed: LiftMaster Premium Series®, Belt Drive garage door motor. Energy efficient and smart Wi-Fi opener equipped with Wi-Fi, Security+ 2.0® and MyQ® Technology. Garage door opener remotes, wall control panel and keypad were installed. Installation of a brand new residential garage door and opener in the city of Redding, CA with a 1/2 HP Liftmaster Belt Drive garage door opener. Featuring the "Universal Series" sectional garage door, a cost effective garage door built for strength and durability. 2019 © Scott's Garage Door Services. All rights reserved.